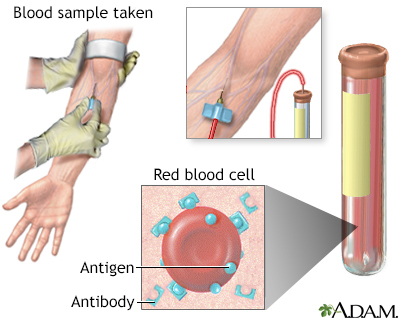 The antibody level (titer) in the blood tells your health care provider whether or not you have been exposed to an antigen, or something that the body thinks is foreign. The body uses antibodies to attack and remove foreign substances. In some situations, your provider may check your antibody titer to see if you had an infection in the past (for example, chickenpox) or to decide which vaccines you need. Normal values depend on the antibody being tested. If the test is being done to look for antibodies against your own body tissues, the normal value would be zero or negative. In some cases, a normal level is below a specific number. If the test is being done to see if a vaccine fully protects you against a disease, the normal result depends on the specific value for that immunization. Negative antibody tests can help rule out certain infections. Abnormal results depend on which antibodies are being measured. There is little risk involved with having your blood taken. Veins vary in size from one person to another and from one side of the body to the other. Obtaining a blood sample from some people may be more difficult than from others. Kroger AT, Pickering LK, Wharton M, Mawle A, Hinman AR, Orenstein WA. Immunization. In: Bennett JE, Dolin R, Blaser MJ, eds. Mandell, Douglas, and Bennett's Principles and Practice of Infectious Diseases, Updated Edition. 8th ed. Philadelphia, PA: Elsevier Saunders; 2015:chap 321. McPherson RA, Riley RS, Massey HD. Laboratory evaluation of immunoglobulin function and humoral immunity. In: McPherson RA, Pincus MR, eds. Henry's Clinical Diagnosis and Management by Laboratory Methods. 23rd ed. Philadelphia, PA: Elsevier; 2017:chap 46. The antibody level in the blood is a reflection of the body's past experience or exposure to an antigen, or something that the body does not recognize as self. Every living cell has different protein markers on its surface called antigens, and the body's immune system identifies those cells that are not part of its structure by those surface proteins.